My father knew the value of relationships. As a commission-based salesman, he was never one to miss an opportunity to show his appreciation to his clients. One of the best things he did was each Holiday season, he gave each of his customers and vendors a tray of beautiful homemade Italian Christmas cookies. The first year my he and my mother worked for weeks to get all of the eighty plus cookie trays baked, wrapped and delivered. The following year, he made half of the cookies and bought the rest from a home-based Italian baker. 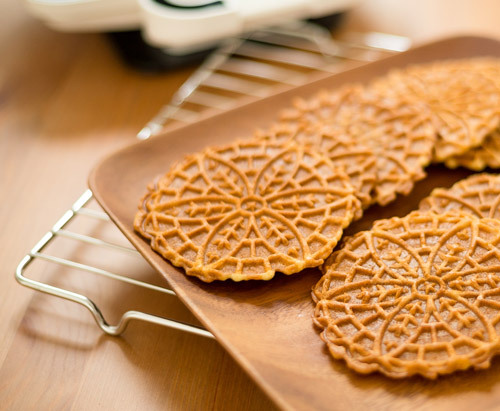 Eventually, he just made one kind of cookie – the heavenly, snowflake-shaped pizzelle. But to his customers it didn’t matter if he made them all or not. After that first year they were hooked. Even when he told his clients that he didn’t make all the cookies, all they saw was a gift given from the heart. The beautiful and exotic tray of cookies were just a vehicle for my father to share a piece of himself. Take the time to show your customer and vendors just how much you appreciate them. No one ever measured the Return on Investment on my Father’s Christmas cookies, but I can tell you that everyone in his local industry was aware of the impact of these gifts. His customers bragged about them, and his competitors wished that they had thought of the idea. Now, more than 15 years since he retired, people still talk about and remember my father for those cookies. Everyone can appreciate the power of a simple personal gesture. Now that you know about the cookies, can you think of a unique and thoughtful way to show your customers appreciation this Holiday Season? Amen! And really, doing this year round can lead to immense business success. I circle the globe through pro blogging by appreciating the heck out of folks who buy my courses and eBooks and who hire me. Thanks for sharing the important message!